Cause it's a zombie attack! 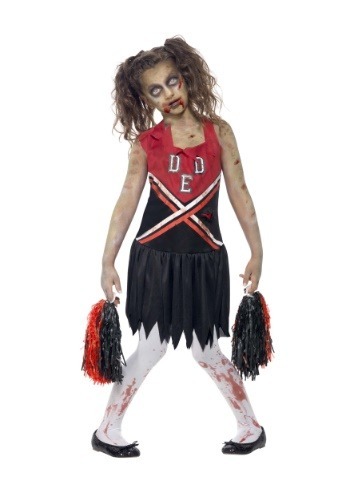 An overwhelming amount of school spirit and a perky disposition aren't requirements to make the zombie cheer squad. In fact, they're looking for girls who are the exact opposite of typical 'cheerleader material.' The zom-pom squad is recruiting girls who show indifference to just about everything, except for gobbling up fresh guts. (Mmmm fresh guts!) As long as you're capable of moping around lifelessly while gripping a pair of pom-poms, you'll make the squad. Now get out there and hype up fans to rip apart the opposing team. Literally. Like we said earlier, you'll definitely make the zom-pom cheer squad but we'll let you in on a few secrets to really impress the coaches. Grab a pair of blood-stained tights and a zombie makeup kit for a look that says, "I eat brains for breakfast."